Papua New Guinea’s public servants will soon have a new range of training courses available to them through the Papua New Guinea Institute of Public Administration (PNGIPA), thanks to an initiative to refresh the Institute’s training offerings by the Pacific Leadership and Governance Precinct. 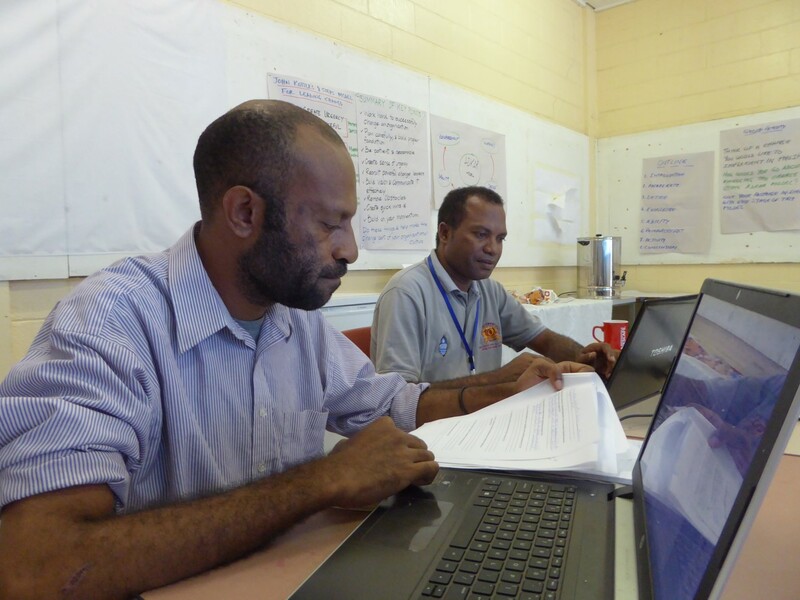 Nine staff members from PNGIPA are currently studying for a Diploma of Training Design and Development, to be completed in August, which will see them refine governance, management and leadership courses available to public servants. The new courses, which are based on an Australian framework and tailored to the PNG context, will be rolled out in 2017. “These courses will be primarily for people looking to enter the public sector within PNG,” explained tutor Neil Bauer from CIT Solutions, who has been engaged by the Australian Public Service Commission (APSC) to deliver the Diploma, through which the nine PNGIPA staff members are updating the Institute’s courses. Peter Sapsi, Deputy Director of PNGIPA, is updating the Diploma of Leadership and Management, and says the new courses are crucial as the Institute transitions to become the PNG School of Government. “Previously we focussed on academic knowledge and learning was more theoretical. Now we are transitioning to competency-based training, which is more practical and focussed on what people can do in the workplace,” he said. Rebecca Gonapa, a Senior Curriculum Officer at PNGIPA’s Learning and Development Centre, is refining the Diploma in Accounting, and says the updated course will be more useful to public servants. “The benefits of the new diploma will be more work-related. We will be offering the kind of skills that would be required at the workplace so it’s not just all knowledge, it’s more the application of it,” she said. “The new approach also allows us to instil the right attitude in the workplace,” agreed Jack Kwa, Manager of the Learning and Development Centre at PNGIPA. The Pacific Leadership and Governance Precinct is a joint initiative of the Governments of PNG and Australia to promote ethical leadership and strong governance within the public sector at the national, provincial and district level.